The Review: I hadn't heard of Caraval until it arrived from the publishers from one day and since it arrived it's all I've been hearing about in the blogging world. When there is a lot of hype about a book even before it's release, I'm immediately interested and so of course, I just knew I had to find out why everyone loves this book already. 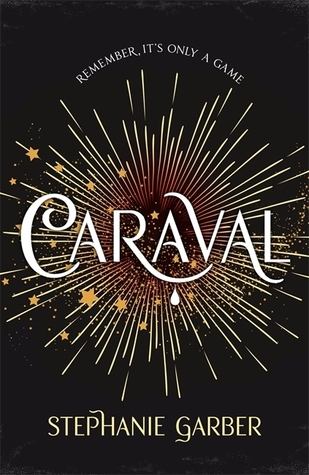 Caraval is a story that offers magic, adventure, romance and of course mystery. The mystery aspect really is a big part of this story - such a big part that for most of the story you have absolutely no idea what's going on. It's mind-blogging and interesting that you can't help but want to keep turning the pages. It's quiet a slow burning read - one that doesn't pick up until the last 100 pages of so but even though I found it a slow read, I was still very much interested in how the story was going to play out. Scarlet's journey wasn't easy - it was hard, brutal and scary and the world of Caraval was more than happy to keep Scarlet from finding her sister. She did have the help of Julian who himself hides more secrets than he's willing to share. Their journey to finding Tella was intriguing and even though I'm not a fan of Tella I did want to see her safe for Scarlet's sake. Their romance for me was the best part of the story because it was unexpected and innocent and they did have a some lovely touching moments in between the craziness that is Caraval. In all, I believe Caraval will be a hit for many readers and it's definitely a story I enjoyed - especially with that twist at the end of the story that you won't see coming. 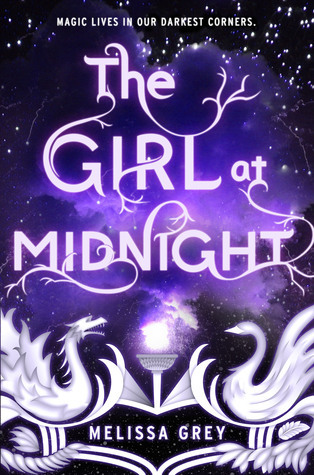 The Review: YA Fantasy is really becoming my favourite genre and The Girl at Midnight just proves how strong this genre is becoming. I’ve had sitting on my shelf since it first released. I knew I wanted to read it but as normal it was just finding the right time and the right time was Christmas break and I’m really glad I decided to read it. I really enjoyed The Girl at Midnight and I loved Echo’s story. It does start of quiet slow but after you’ve read the first few chapters you can see where the story plans to go and it was something I was immediately excited about. The story is about a teenage thief who is also an orphan. She is taken in by an ancient race of people called the Avicen and brought into their world where they are at war with a different race – the Drakharin. They are all after the mythical firebird which is supposed to bring peace and stop the war to the person who finds it. This book surprised me. I wasn’t too sure I was going to enjoy it at first but once I got past the first 50 or so pages, I was gripped. It was a great introduction to the series and you definitely get enough information about each different race to enjoy and under their worlds. I really enjoy stories that are unique and I did think this one was. It does have some similarities to Daughter of Smoke and Bone by Laini Taylor but there are only minor similarities and still stands out from some of the other fantasy stories I’ve read. Echo was a great character – one full of passion and fun to read about. She enjoys getting into mischief and being chased through portals from angry people who she has stolen from. She’s loyal to the Avicen but what I found and didn’t really like was how they weren’t the same to her – purely based that she’s human. She helps them and they just disregard her – except for a few that have come to care for her. The Drakharin – Cauis in particular were great. As a reader though I have to say I’m not sure whose team to be on – Team Avicen or Team Drakharin. I know it’s never that simple with fantasy books but the Drakharin don’t appear to be as evil as the Avicen make them out to be so I’m hoping to get some more information about them with the next book. The story also has the right mix of action, suspense, trouble and of course romance. By the end of the book I honestly didn’t want it to end. There is a big reveal as well that I still can’t believe I didn’t figure out – great twist! I for one can not wait to continue with this series! It’s been a few weeks since our last post featuring Bookworm Candles and Crafts and as promised I’m here today to showcase some of their latest work and some of their newer products which will becoming available soon. Firstly I’m going to start with their December monthly subscription box. For those of you who don’t know what a monthly subscription box is, it’s a box full of bookish themed goodies. It contains six to eight gorgeous bookish items which have all been handmade by Bookworm Candles & Crafts and put in a cute box for you to enjoy. Included in the box is a candle tin, a handmade themed soap and a few more surprise items, all within the special chosen theme. Not only that but, each month will be a completely different theme and as they only have a limited amount available, it’s best to order it as soon as it becomes available or you lose the risk of missing out. And December’s theme was inspired by the amazing school for witchcraft and wizardry Hogwarts - Christmas at Hogwarts! *Hogsmeade Candle: 4oz candle inspired by the town just outside of Hogwarts, smelling like freedome, plums and cranberries. *Chocolate Frog Soy Wax Melt: This beautiful wax melt comes in the shape of a frog and smelling like strawberries and cream. *Golden Snitch Necklace: This gorgeous necklace is perfect for any Harry Potter fan and is made with a Swarovski crystal pearl. *Patronus Glitter Soap: Beautifully wrapped and with Bookworm Candles & Crafts signature details this soap is made with shea butter and smelling like dreams, wishes and smiles. *Aroma Beads Bauble: A perfect Christmas gift which can hang on your Christmas tree until you’re ready to crack open. Smelling like Christmas in the great hall. *Ribbon Bookmark: A lovely orange fabric bookmark which is pumpkin themed. Donna’s thoughts: Even though I’m not a Harry Potter fan (don’t shoot me) I still wanted this box and thankfully a friend bought it me for Christmas (thank you Natalie). Even though I’m not a fan of the series when this box arrived and I saw everything that was included, it’s safe to say I was overwhelmed because it all looked so perfect. You can see how much effort has gone into each item and I think it’s amazing that Danielle has the creativity to create such perfect items for us all to love and enjoy. My favourite item from the box has to be the Golden Snitch Necklace. It’s so well made and looks so pretty. January’s monthly box is already available for pre-order for just £16.50 plus shipping. 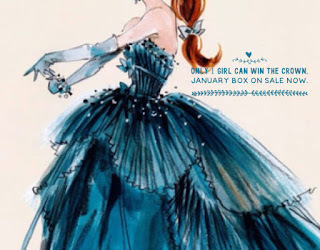 The theme is from one of my absolute favourite book series – The Selection by Kiera Cass – Only One Girl Can Win the Crown! Don’t forget if you plan on making any purchases from Bookworm Candles and Crafts store, save yourself 10% by using my code: BOOKPFORLIFE10 and you can order Only One Girl Can Win the Crown HERE. Twilight Moment Inspired Candle - Bella and Edward's Island Retreat. Bella and Edward's Island Retreat is the first moment candle to hit Bookworm Candle and Crafts store which is inspired by Bella and Edwards's honeymoon on Isle Esme. 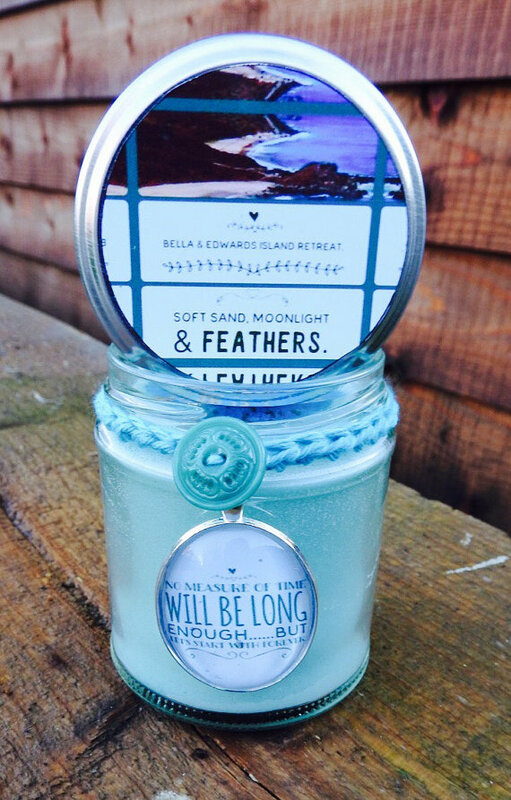 Smelling like soft sand, moonlight and feathers this candle has such a balmy beach feel to it. The colours of turquoise and teal compliments it perfectly and it also comes with a button and a gorgeous large quote pendant that you can use after the candle has finished. All The Bright Places Moment Inspired Candle - Finch And Violet's Wandering Moments. 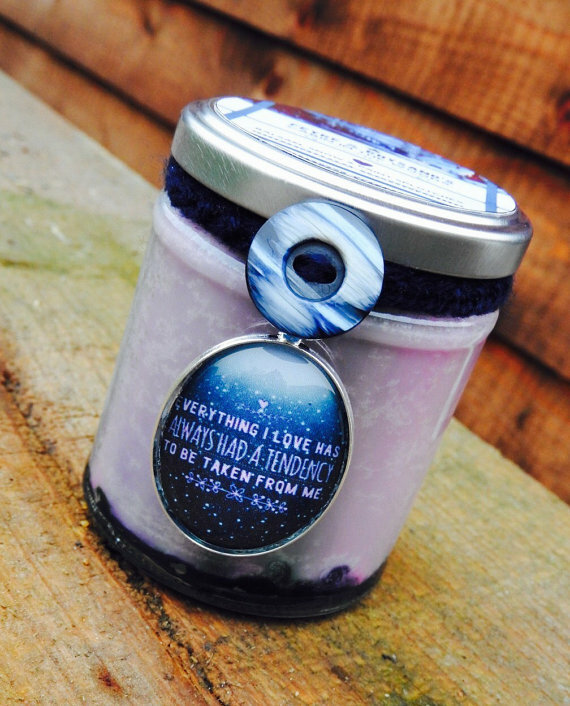 Finch and Violet's Wandering Moments candle is inspired by the characters wandering moments throughout the book. Smelling like lavender, coconut milk and projects and, is in shades of lavender and purple in honour of Violet. Again, it comes with a button and a gorgeous large quote pendant that you can use after the candle has finished. A Court Of Mist And Fury Inspired Candle - Feyre and Rhysand's Cabin in the Woods. Feyre and Rhysand's Cabin in the Woods candle is inspired by *cough* the amazing chapter 55 which we are all completely swooning over even months later. This candle smells woody and fresh and the description is balsam, snow and of course those infamous paint splotches which as you can see, this candle comes with it's very own paint splotches to make you really hold onto the moment. 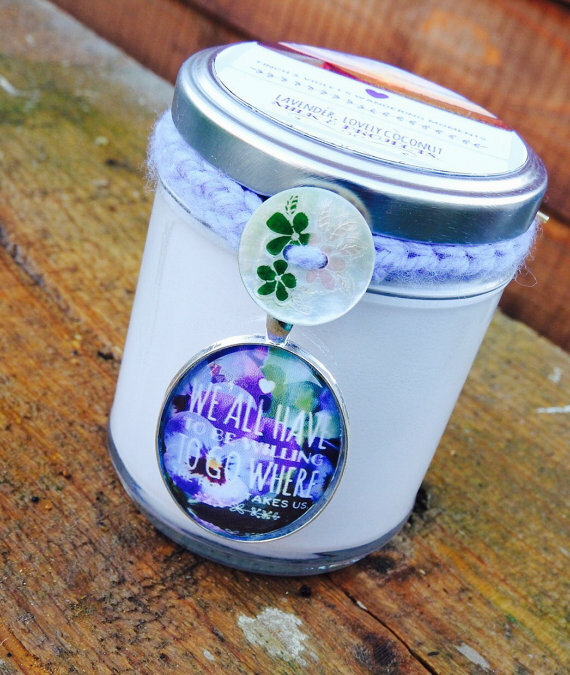 it comes with a button and a gorgeous large quote pendant that you can use after the candle has finished. All these candles are 6.5oz and are priced at £9.50 per jar plus shipping! Amazing deal! So to end off today's post we have a little giveaway for you! & a Mist and Fury handmade soap scented with deep violet musk and containing lavender petals. You can enter via the giveaway tool below. The giveaway will run until the end of January! Good luck! And see you next month for another feature post. 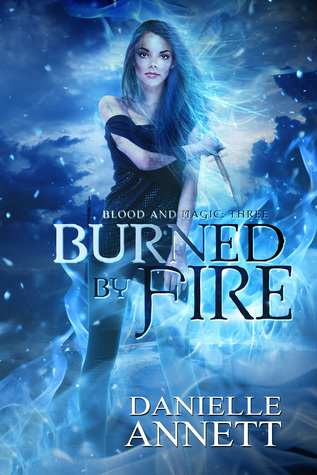 The Review: Burned by Fire is the third book in the Blood and Magic series and there is definitely no let up in the action and drama for our heroine Aria. We join Aria when she finds a near fatally wounded Inarus in her home and discovers that he is now under a death sentence after having his identity exposed to the Human Alliance Corporation. Aria plans to protect him and decides to bring him in on an urgent investigation that arises when a child of the coven is kidnapped. Whilst investigating this situation, many more problems arise when her ‘mate’ status is put to the test in more ways than one – leaving her confused and feeling used. As always, the HAC has some dastardly plans afoot which has a lot more going on than meets the eye. Aria certainly has her work cut out for her in this book, where both body and heart will take a battering. Now...I love this series! You can tell too since I came out of review exile for it. Aria has grown and developed as a character once again. She let’s a little vulnerability through here and we can see the growth through the houses she makes and how she comes to those decisions. Aria and Declan are still clashing -in good ways and bad-which is always a good thing but I liked how she seemed to weigh up her decisions a lot more and even though she tends to run when things get difficult, she is beginning to realise her actions are really a defence mechanism and chooses to acknowledge that. Also, even though her status in the pack has questionable beginnings, it seems as if progress is being made towards an understanding. This book had it all for me. Whilst matters of the heart were important in the story, we can’t forget that there is an actual investigation happening into another kidnapped child and the finger is again pointed solely at the HAC. So not only do we have that but we have Intrusion being constantly targeted too which brings random bursts of action and drama to the plot. This added a lot of excitement to the story especially when Aria is targeted too, because of course when Aria is in trouble...... the pack will follow. There is a big sense of foreboding throughout that hints at some bigger picture happening and whilst some avenues are dissolved, some powerful alliances are formed with Aria being the facilitator. This gives me high hopes for the series and the possibilities it represents. Aria seems to be having trouble with her power to and this could be very interesting in the future due to happenings in this book plus I don’t think we’ve seen just how powerful she really is..... yet. As always, the book is well written, has amazing characters that are set in a rich background of magic, mayhem and power struggles. The action and adventure we have came to love is there in abundance and it definitely keeps your interest in the series alive with the want for more. I couldn’t recommend this series enough if you’re after a great urban fantasy read. Thank you to Danielle Annett for giving me the opportunity to review this book in exchange for an honest review.